Summertime is arguably the best time of year. Being able to spend all day splashing in the waves and tanning on the beach. Just as the long exposure to salt and sun effects your skin, it takes a toll on your gear too. No summer is complete without taking a dive into all the underwater world has to offer. 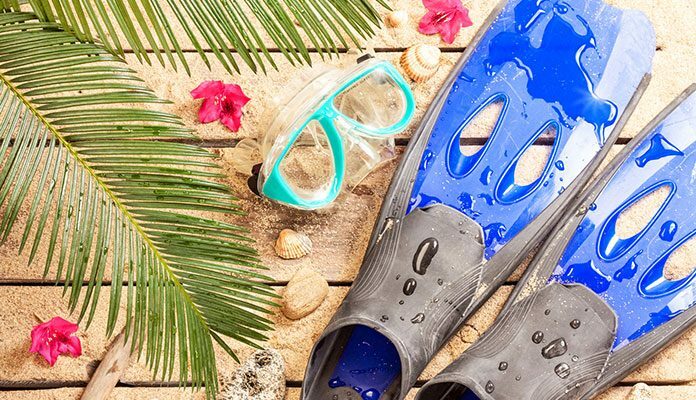 Whether it is your first time snorkeling or you are preparing for your next dive vacation, it is important to take care of your gear. This includes caring for your fins. You may be wondering how to best care for your fins, especially if you are traveling with them. We have created a list of all you need to know about prolonging the life of your fins below. Let’s jump in. When you are taking your fins out of storage for the first time, there are some things to keep in mind. First, be sure to check the integrity of your full fins, including the foot pockets. Signs of dry rot include cracking or deterioration of the rubber. Most often this is seen in the foot pockets. If you have an open heel fin be sure to pay close attention to the area near the buckles. Loosen the strap to fully inspect it and make sure everything is moving smoothly. Doing this well before your intended trip into the water will ensure that you have time to order replacement straps. For larger issues with the blade, you may be forced to buy new fins if the cracking is bad and the integrity is compromised. Whether you are driving to the beach or flying to a tropical destination, it is important to take precaution to ensure that you keep the integrity of your fins intact. If you are planning on bringing your fins for snorkeling on your vacation you should take care to protect them. You may have to store them in your luggage. If this is the case, put them in between your clothes (just another reason to keep them clean). This way you eliminate the chance of them being damaged if they are at the top or bottom of your bag. When traveling to your hotel try to keep your bag out of extreme heat. This can actually cause your fins to change their shape. Even though they are insulated by your clothing your bag can still heat up to over the manufacturer’s heat limit. If you plan on using your fins a lot this summer you should be cleaning your gear after every use. You don’t have to go through the steps of storing your fins but should clean them regularly. What you should be doing is making sure you clean them after every swim. This is especially needed if you are swimming in the ocean. This just means to make sure you don’t have seaweed dangling off them and rinsing them in freshwater. If you plan on spending time on the beach just make sure the fins are out of direct sunlight. This can mean putting them in a shaded spot or under a towel. If left in the sun all day, especially with salt water on them, your fins can actually start degrading. You should take a few steps when you’re storing your fins, especially for a long duration. If you store them with a layer of salt and debris on them, your fins will not look the same when you go back for them in the summer. Clean them with a mixture of soap and water. You are wanting to get all of the salt residue and debris, like sand and dirt, off the fins. If you are having some trouble let them soak in the solution while you get a scrub brush. Be sure this isn’t one with strong bristles, you are just wanting to clean not scratch. To keep the boot soft use a product called Seal Saver. All you need is a couple drops for each fin. Make sure you cover the entire boot, this will ensure it doesn’t start to crack or deteriorate over time. Your fins should be stored in a cool room out of direct sunlight. This can cause them to lose their color and dry out. Also, make sure that your fins are stored separately from your mask and snorkel. Booking your dream snorkel vacation is fun when properly prepared. If you feel like branching into scuba diving, the fins used for this are similar and require the same rigorous attention to care. The lifespan of your fins should be quite long if cared for appropriately. A simple rinse and removal from direct sunlight will ensure that you can use your fins for much longer than expected. Proper care for your fins should not take very much extra time and will work to make your money go much further. It is common to travel with your gear and can make your holiday much more enjoyable. Bringing gear along can save you a lot of money, but only when cared for properly. Having a bag to stow your fins in will make it so that you can enjoy your fins for much longer. Did this guide help you know how to better care for your fins? Let us know in the comment section below.